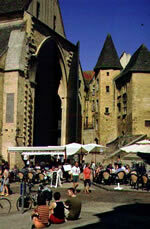 The historic fortified bastide of Domme is only 28km to the north, Sarlat with its numerous mediaeval buildings, amazing market, restaurants and street entertainment 38km to the north east, Rocamadour 55km to the east. Montpazier, one of the prettiest fortified bastide towns in France, 32km to the west, Gourdon the ‘capital’ of the Bouriane and a bustling market town 20km to the north east and Cahors , Lots principal town 45km to the south east. The property is 29km from the Dordogne river in the north and 33kms from the Lot river in the south, both rivers offering canoeing and river trips. The area offers wonderful walks, horse riding at Frayssinet-le-Gelat, 13km to the south west, sandy beach and swimming in the Lac Vert at Catus, 19km to the south. Marminiac (half a kilometre) – an easy 5 minute walk with church and pentanque court. Cazals (3 kms) – a traditional market town with small supermarket, bank, pharmacy, restaurant/ bars, newsagents, three boulangerie, post office, recreational lake etc. Weekly Sunday market. During the bank holidays and summer months regular festivities take place here.